Although we’ve blown some teams out in the first quarter, I think the world’s catching up. Sometimes it’s taking us a little bit longer to put them away. That’s a tribute to people who are … Japan’s a good team. They put us back on our heels and they made us play a little bit differently than we’re used to playing. But, I thought we found good combinations out there on the floor that opened the game up for us. This is a very young team. It’s been a long time since the USA National Team has had a team with this little experience. Is that a concern for you? We’re just moving forward. We can’t worry about what the inexperience is. We have to get better each and every day. No matter what we’re doing, whether we have inexperienced or experienced players, we have to implement the type of basketball we want to play on both sides of the ball. From there you pretty much fill in players. We’ll get better with more and more prep time that we have, because we’ve gotten better in the time we’ve been together. Japan has been training since April. That’s non-stop. So, for us, we got together on Sept. 3 and it’s the 10th, with a couple of days off. That’s not very much. But, for the players who have dedicated themselves to being here and helping us get better and prepare for the World Cup, I think we’re moving in the right direction. How many are you taking overseas? We’re going to take as many as the committee wants us to have. We never know who we may or may not have. The more people we have there, the better prepared we will be just in case we don’t have a couple of people that are playing in the WNBA Finals. You watched A’ja Wilson grow up and mature as a player. What kind of impact is she having on this team? She’s just being A’ja. She’s taking what she’s given. Obviously the experience in the WNBA really has helped her, has helped her confidence, has helped her grow as a basketball player, because she sees different looks out there when she’s playing in the WNBA. In college, she saw one look: double and triple teams. And when the game opens up a little bit for you, she’s able to show all the facets of her game. I think playing for Bill Laimbeer is probably the best situation to be in, because he pretty much just gave her the keys to the car and said, ‘go drive it.’ And with that comes responsibility. I think Asia’s one that’s mature enough to know what to do with that, and I think just being in college and having the luxury of the keys to that car helped her, so it was real familiar to her. Your first experience with USA basketball was, an under-19 tournament in Spain. You guys went 3-4. Could you imagine back then that you’d be still with USA Basketball now, and how is going back to Spain, now as the head coach of this? No, I didn’t think I’d be invited back after probably the way that I displayed some of my Philly-like behavior (laughs). So, to see me come full circle, I had no desire to be a coach, but just from coaching, it brings out other aspirations once you get in. Once you coach at a collegiate level or major, you want to coach at a Power 5 then, you get a little bit of coaching experience being an assistant coach with an Olympic team, now the head coach. Through basketball, you learn to aspire to be the very best and fortunately for me, USA Basketball has been an organization which for me is basketball utopia. All of the players that you see on our roster, most of them are starters. Probably all of them are starters in their own right, but they come here, and they’re selfless beings. They want to win. A lot of older players probably didn’t play as many minutes as they wanted to play, but the bottom line is us getting the win. When you’re in that kind of atmosphere, you want to keep coming back. I couldn’t see myself back in ’89 being here, but now that I am, I understand why. Do you understand how Tara VanDerveer might have felt with the ‘96 team and the responsibility that goes along with it? Yes, but I promise I won’t put our players through what Tara put us through (laughs). I promise you that. I often talk to Tara. Tara has been an advocate for me to be in this position, and obviously she comes with a lot of experience, coaching experience, coaching an Olympic team, so she is someone that I lean heavily on to help me throughout this process. It doesn’t mean you’ve arrived, by any means. You always need little wrinkles here and there to help you be successful at this level. What does assistant coach Jennifer Rizzotti bring to the table for this team? Jen is great. I’ve had the luxury of working with Jen from the Rio Olympics like four years ago until now. She’s got a great basketball mind. She’s truly passionate about basketball, and she’s much like she was as an opposing point guard. Her wardrobe is a little bit different, but her impact is still the same, whether she’s in Connecticut or now here in D.C. Her impact on the community, her impact on our game, her impact on our USA National Team, is felt. I know her players are going to be better here because of her experiences with USA Basketball. It just brings out the best in you, and it brings out so many opportunities to learn and just give back to our collegiate game. You’ve had a small sample size of this roster. I’m just wondering if there’s any individual in particular who’s surprised you in exhibitions? I’m not surprised. These players do this night in and night out. What I’m surprised, but not really, is that we have some young players on the team who are used to playing for their respective teams. For them to be able to handle not playing, sometimes they don’t play in a quarter or a half, but they’re cheering the loudest for people making plays out there on court. So, that breeds success, especially with USA Basketball. That is a culture that keeps all of us coming back, to have the players that give it up for the greater good of our team. What specifically do you guys want to work on heading into France to prepare yourself? We just need more prep time. We need to work out some kinks. We have to get all on one page, because we don’t have a whole lot of prep time. A lot of our time together and on the court playing in games is times in which we have to make adjustments, so we just need experience playing together and playing a different opponent. Japan knocked down shots. But, we knew that they would do that. They’re going to drive, and it’s really hard to help, because everyone can make 3s. They played really well, but we were able to last longer in that fourth quarter. Coming back in back-to-back games, how much does that help the team focus on the goals of this team? It helps a lot. I think for the younger players, when I was about their age, I started to realize that when you have USA on, you always have a target. Everyone’s going to play their best against us, and when it comes to the World Cups and Olympics, it’s just who can play for 40 minutes. It shows these last two games that we can play for 40 minutes and outlast those two teams to come out with the victory. You and Tina are the only ones who have experience with the senior team right now. How is that playing out for you and your experience is a lot right now, so how is that playing out with this team and how does it affect your role? Coming in, that was evident that we had fewer vets than we’re used to. But, I’m very comfortable assuming any type of leadership role that I can work into. 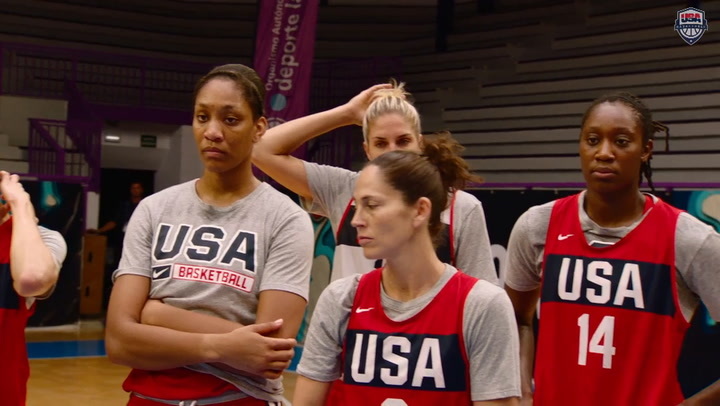 I think the experience I’ve had with USA Basketball, it’s been a very progressive maturation. I was on the last World (Cup) Team, close to making the Olympic Team. But, every single time you come, whether it’s training camp, a championship, World University Games, it’s always an experience. That’s something that we’re harping on this time around, especially with so many new faces that we have. We’re using this opportunity to get better in order to go to the Worlds, and do what we need to do. Also, for a lot of these young players to understand that any moment could be your moment. You have to let go of anything else that isn’t the moment. I think we’re doing a good job, especially coach, she’s really making it clear that we’re here with who we have. We’re not going to talk about who’s not around. There’s still business in front of us. I’m trying my best to lead by example in that regard. After working with Dawn Staley as an assistant coach on the 2014 USA World Cup Team, is she any different as a head coach? I was actually just talking to Tiffany Mitchell today, I was like, ‘Man! Is Dawn always this chill?’ She’s very easy going, super easy to talk to, on and off the court. I think that some of the calm collectiveness, it gives you the confidence that she knows that you’re a ballplayer and you know what you have to do when you’re out there. She just guides us in the right direction. It’s really nice, especially coming from the professional side of things. It’s been seven years now, and there are times when the coaches are just kind of like, ‘We can’t coach every single thing.’ So, I think it’s helping a lot of the younger players. Granted, we always need structure to some degree, but it’s really developing the minds of the younger players, especially the guards. 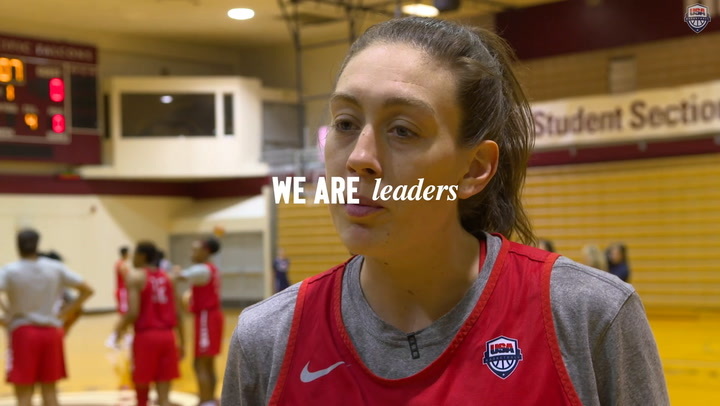 What’s it like coming to the USA team so soon after your WNBA season wraps? Is that difficult? I mean, after this season, the seven days I had of doing nothing was fantastic, so it wasn’t really that serious for me. I knew I was coming to USA from the beginning of the season, (as long as) I stayed healthy. So, obviously this season I wasn’t 100 percent healthy, but I was able to play and muscle through. But that seven days really made a difference for me coming into USA, and it was also kind of a nice little gem that I don’t have to play 35 plus minutes every game. It has been an amazing experience. Anytime you get an opportunity to play with the best players in the world and learn from them and a high level of competition – I’m so grateful. USA Basketball is something I always look forward to, and it’s an opportunity and I always make sure I make the most of it. Do you feel the pressure to compete to replace Sue Bird’s spot in the future? No one will ever replace Sue. Sue is in a category of her own. For me, I don’t focus on that. Obviously, I’d love to be on the Olympic team, that is a dream of mine. I try to focus on practice to practice, game to game, possession to possession, how can I help my team get better? I think if you get caught up in trying to be like someone else, you are going to lose it, lose your competitiveness and your focus. That’s not something that I look at. It’s unbelievable. One through 16, anyone that steps on the court has the ability to just make plays, and the athleticism, the size, the speed is unreal. So, it’s always a competitive environment, and I think that’s why I enjoy USA, because you got to bring your best if you want to stay. And so, everyone in that room is extremely talented. I mean, credit Japan. They came out and they shot it really well and moved the ball really well one through five. They play a little bit of a different style, so I think we kind of had to get punched in the face a little bit and see what they were doing. Defensively, I thought coach Staley did a great job. We adjusted a little bit. 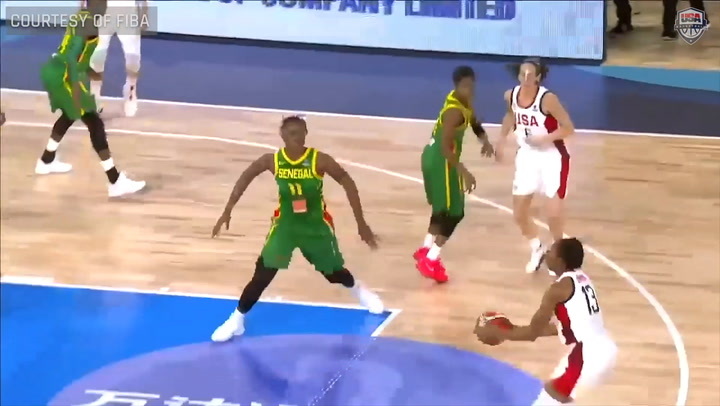 We switched on-ball screens and we were able to stay out and play one-on-one defense. And, I thought they players that came in, Odyssey (Sims), Tiffany Mitchell, Nneka (Ogsumike), they played great defense, and I think that is what won us the game. Honestly, playing for coach Staley is the thing that’s given me a lot more edge. Just being comfortable, honestly, just being around her. She knows the game so well. She puts me in the best situations on the court, so I can appreciate that. To see her being the Olympic coach, it really warms my heart. I probably wanted this more than she wanted it. She has really helped me so much. Not just as a woman, but as a player as well. So, it’s just so exciting. It’s definitely been a lot more fun playing for her now. I had a break from her for one season, which was definitely a lot of fun. How much has Bill Laimbeer helped your game? He’s helped me out a lot. Coach Laimbeer has talked me through a lot of things. He taught me how to see the defense, how to get moves away and to create and-ones and get to the free throw line. He’s definitely helped me out a lot. He and coach Staley are very similar. They’re both players’ coaches, and I can really appreciate that, because they know the game so well. A lot of people talk about wanting to play for the USA. Has that always been something you’ve wanted? It’s been a dream of mine for the longest time. I feel like every girl wants to be an Olympian, and it takes the best to get to that level. So, just to have the opportunity to compete against the best, to play alongside the vets, whether it’s been training camps or games like this, it’s definitely been a lot of fun.